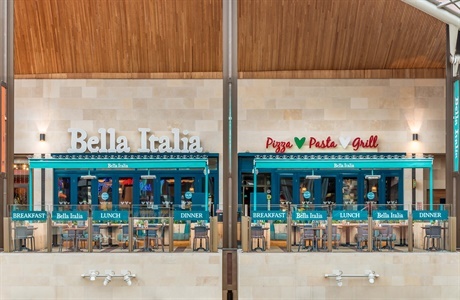 Brighten even the gloomiest of days with a trip to the all-day Italian restaurant, Bella Italia. You will be presented with a wealth of familiar Italian food including pizza and pasta. True to the Italian roots, the restaurant maintains an authentic Tuscan country kitchen feel with poster prints on the walls, tiled flooring, warm earthy hues and copper pots and pans framing the confidence inspiring open kitchens.